Gothenburg, Sweden, June 18, 2018 – Volvo Ocean Race round-the-world team 'Turn the Tide on Plastics' has won the Bluewater 2018 ‘Water Without Plastic Legacy Award’ with its proposal to donate a Bluewater water station to the School of Environmental Engineering at Guangzhou University in China. Noting that Guangzhou sits on the badly polluted Pearl River, Turn the Tide on Plastics said siting a Bluewater water station at the university will help showcase the importance of clean water for future generations. “The Bluewater Water Without Plastic Legacy Award is designed to leave a lasting legacy of the Volvo Ocean Race. 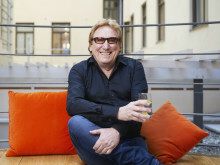 The award is driven by the aspiration to help a small community, school, hospital or similar benefit from enjoying access to an ongoing supply of clean drinking water and removing the need for single-use plastic bottles,” said Bluewater founder and CEO, Bengt Rittri, a Swedish environmental entrepreneur. He said each team competing in the Race was tasked with motivating why their vision will make a tangible difference to both human and planetary health and to come up with an innovative idea for siting a Bluewater hydration station, which will be installed and maintained by Bluewater. Dee Caffari, award winning skipper of Turn the Tide on Plastics and the first woman to have sailed single-handed and non-stop around the world in both directions, said the team believed that siting a Bluewater water station at Guangzhou University would ‘strengthen the University to continue their work on combating plastic pollution – not only awareness around the problem’. During the Volvo Race visit to Guangzhou earlier this year, UN Environment staged the first ever outreach seminar in the framework of China Council, which gives recommendations to China Government on Ocean Health, and marine pollution including marine litter. “The people at the Environmental Engineering School will be the solution providers for the future expansion of efforts to improve the lot of the environment in the future,” the Turn the Tide on Plastics winning proposal stated. “The historical connections between VOR, Bluewater and Guangzhou shows a very real sense of legacy,” said Dee Caffari. Bluewater President Anders Jacobson said that the efforts by Bluewater to "raise awareness around how the marine plastic pollution issue is connected to the clean drinking water scarcity globally during this Volvo Ocean Race are key to helping to find solutions beyond those that exist today". Bluewater has also launched its Urban Drinking Water Challenge in partnership with Imagine H20 and 11th Hour Racing to address urban drinking water challenges in a world where the UN predicts some 5.7 billion people will be living in urban areas running short of drinking water by 2050. 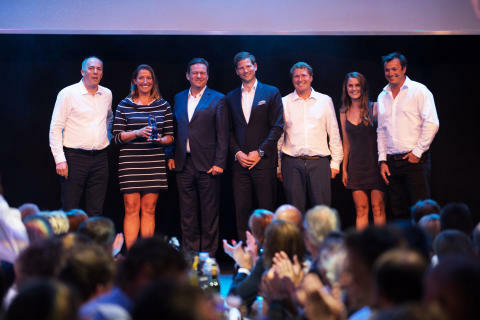 The prize was presented on stage during the Volvo Ocean Race awards gala dinner in Gotheburg by the founder and CEO of Bluewater , Bengt Rittri and President of Bluewater Anders Jacobson. The jury comprised Dr Lisa Svensson, Director Oceans, United Nations Environment, and Mr. Thomas Kimber, founder of Karun World, which makes fashionable eyewear made with 100 percent recycled fishing nets.